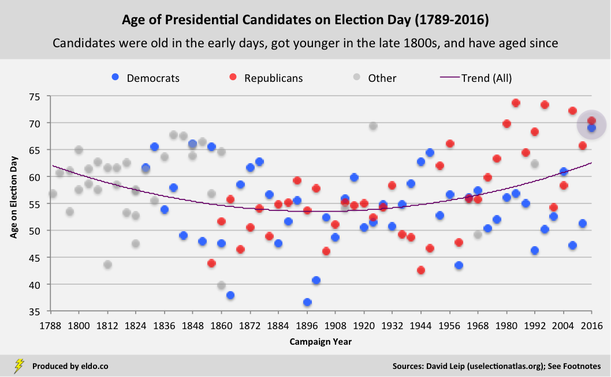 That purple smiley-face trendline indicates that candidates were old in the early days, got younger in the second half of the 1800s, and have aged since. 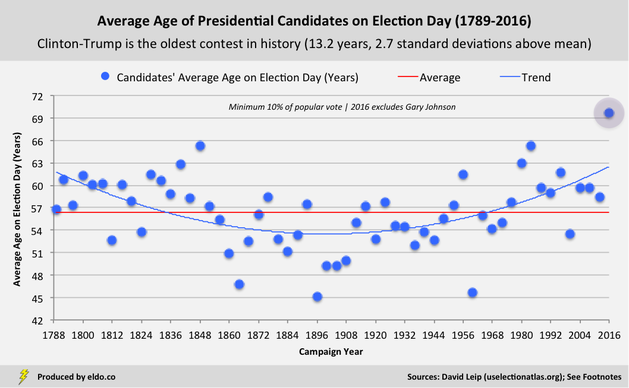 Prior to 2016, modern candidates were, on average, about as old as the founding fathers. A typical mix of young Democrats and old Republicans put us on par with George Washington (56.8 in 1788, 60.7 in 1792), John Adams (61.0 in 1796), and Thomas Jefferson (61.6 in 1804). ​After decades of relative youth in the late 1800s – headlined by William Jennings Bryan (36.6 in 1896, 40.6 in 1900), George McClellan (37.9 in 1864), and John Breckenridge (39.8 in 1860) – candidates aged considerably over the course of the 1900s and into the modern day, due in large part to the likes of FDR, Truman, and Eisenhower in the mid-20th century and an array of older Republicans (Ford, Reagan, Bush 41, Dole, McCain, Romney) in the last few decades. During the period, our purple trendline rises by about ten years. That is to say, when we consider where these candidates are in their lives when they run for president – or what percentage of their projected lives they’ve already lived – our purple trendline is rendered nearly flat. 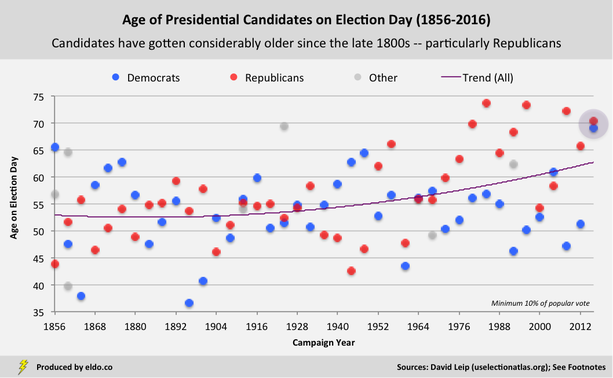 Even though modern-day candidates are considerably older than they were a century ago, they are running for president at pretty much the same point in their lives as their counterparts 50 and 100 and 150 years ago. We already know that 2016 is the oldest presidential contest in history. Here we can see just how much of an outlier it is. With an average election-day age of 69.7, Clinton-Trump is 13.2 years and 2.7 standard deviations above the historical average (56.5 years). They beat their closest competition – 1848 (Zachary Taylor, Lewis Cass, Martin Van Buren) and 1984 (Ronald Reagan, Walter Mondale) – by almost four-and-a-half years. ​One hundred years ago, 70-year-olds could expect to live to about 79. If that were still the case, Clinton and Trump would be done with almost 90% of their lives. But today, the 69.0-year-old Clinton can expect to live to 86.6 (she’s 80% of the way there), and the 70.4-year-old Trump can expect to live to 84.5 (he’s 83% of the way there). The candidates are, on average, 81.5% of the way through their lives. That’s the rough equivalent of being 65 years old in 1988 (similar to George H.W. Bush) or 62 years old in 1952 (similar to Dwight D. Eisenhower). 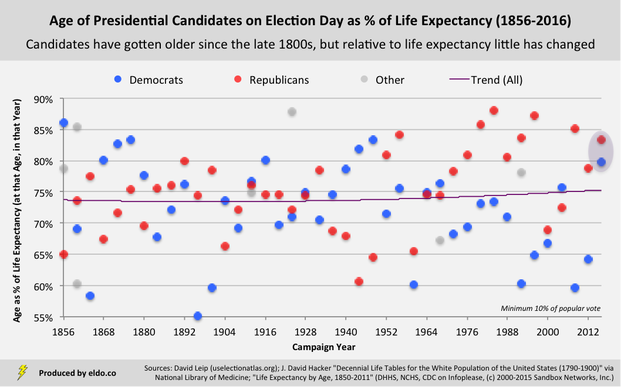 Relative to life expectancy, 2016 is the seventh oldest presidential election in history (out of 58), and it’s within striking distance (1.2 standard deviations) of historical averages (75.7%). It’s still an old election – the oldest since 1848 – it’s just not as old or unique as it might otherwise seem. From the perspective of where the candidates are in their lives – 80% of the way through for Clinton, 83% for Trump – 2016 is not unlike the nation’s earliest presidential races. Its closest doppelgängers are 1804, when 61.6-year-old Thomas Jefferson (83%) beat 58.7-year-old Charles Pinckney (80%); 1808, when James Madison (57.6, 79%) beat Pinckney (62.7, 84%); and 1816, when James Monroe (58.5, 80%) beat Rufus King (61.6, 83%). In fact, Hillary Clinton is at a pretty similar point her life (69.0, 80%) as George Washington when he first ran for president in 1788 (56.8, 78%). And Donald Trump is at a similar point in his life (70.4, 83%) as Washington when he won reelection in 1792 (60.7, 82%). So however unprecedented this year's election may be – from Hillary Clinton becoming the first female nominee of a major party to, well, Donald Trump – 2016 is, in at least one strange way, a throwback to the earliest days of the American republic. In Appendix I, we take a closer look at Democrats and Republicans, Clinton and Trump. 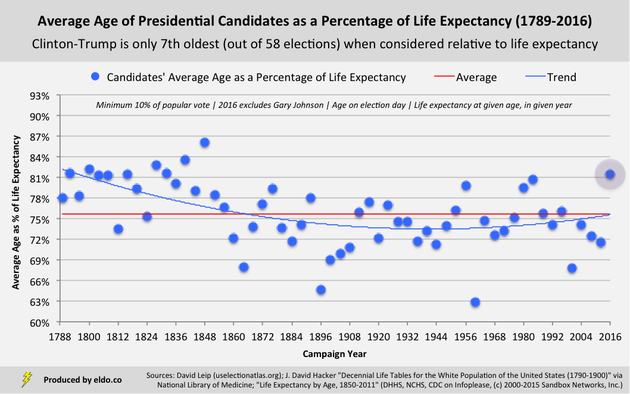 In Appendix II, we rank the oldest and youngest presidential candidates in history, relative to life expectancy. ​ ​Gary Johnson currently projects to win 6.6% of the popular vote, which may very well change. For now he is excluded. The National Archives and Records Administration lists no official record of the popular vote until 1824. For purposes of this analysis, we applied common historical convention and incorporated two major candidates from 1796 through 1820 and one major candidate in 1788-89 and 1792 (George Washington) into our analysis.. The first presidential election began on December 15, 1788 and ended on January 10, 1789. It is commonly referred to as the 1789 Presidential Election, which is why we elected to use 1789 in our chart headers. For purposes of this analysis, we used George Washington's age on December 15, 1788. For all other elections, we measured birthdays as of November 1 of the given election year. And for that reason, Washington's two election-day ages are 3.9 years apart, rather than a clean four. ​ 56.5 is the historical average when you weight elections equally. 56.4 is the historical average across the 124 unique candidates in our sample. Even with the inclusion of Gary Johnson, 2016 would be the oldest presidential in history (67.7 years). It would be 11.2 years and 2.4 standard deviations above the mean. ​ Ages are presented as of Election Day. Clinton celebrates her 69th birthday on October 26, 2016. Trump turned 70 years old on June 14, 2016. American females have greater life expectancies than American men. George H.W. Bush was 64.4 on November 1, 1988; Dwight D. Eisenhower was 62.1 on November 1, 1952. Since 1852, the average "age as a percentage of life expectancy" is 74.0%, with a standard deviation of 7.5%. Clinton-Trump is 1.9 standard deviations above that mean.